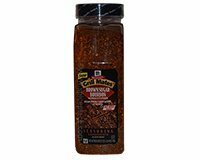 Grill Mates Brown Sugar Bourbon Seasoning is an exciting blend of sweet brown sugar, bourbon, red bell peppers and spices. Use Brown Sugar Bourbon Seasoning on chicken, shrimp and beef. Simply shake 1 tbsp. of Grill Mates Brown Sugar Bourbon Seasoning per 1 pound of steak, chicken or shrimp before grilling or broiling. Ingredients: Sea Salt, Brown Sugar, Evaporated Cane Syrup (Sugar), Spices (Included Red Pepper), Molasses (Refinery Syrup, Molasses, Caramel Color), Garlic, Onion, Red Bell Pepper, Natural Flavor (Including Malted Barley Whiskey Extract), Sunflower Oil and Extractives Of Paprika.